Since I have no room for fruit trees in my little garden, this was a real novelty being able to pick a giant bowl of fresh, sun-ripened fruit straight from the garden. I had to restrain myself to make sure I didn’t come home with more than I knew what to do with. The beautiful sour cherry tree. 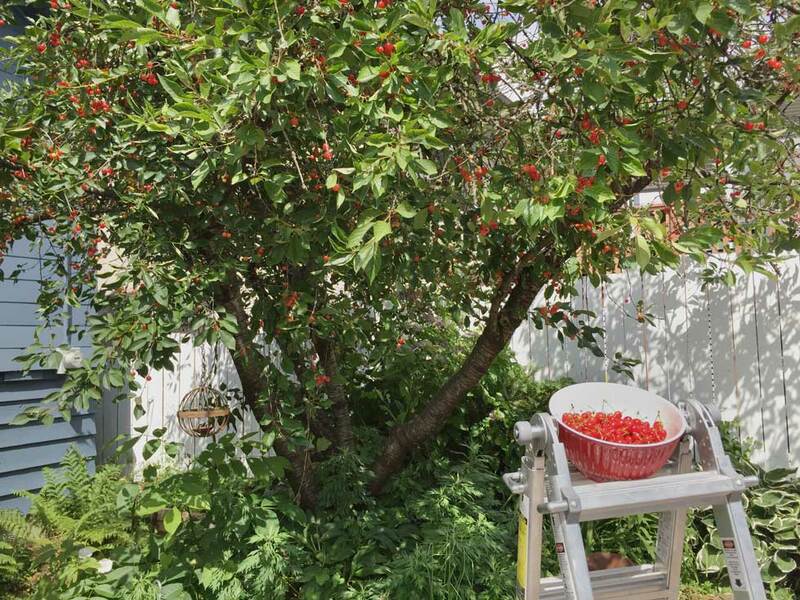 Once I had my massive cherry haul, I had to start thinking of some recipe ideas. I figured a pie was as good a place to start as any, although I just recently made a strawberry rhubarb pie and felt like doing something a little different. I love making cakes, but have always preferred eating cupcakes. There’s just something so much more appealing to me about having a little personal sized dessert. That’s when it hit me. I’ve never made mini pies before. 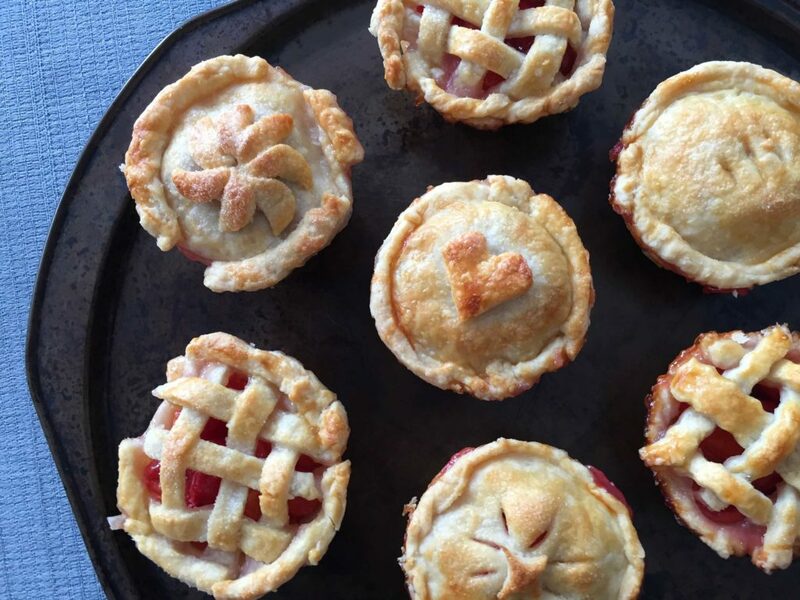 Since I love mini cakes so much, mini pies must be equally as awesome! I wasn’t sure exactly how much dough or filling I would need for 12 mini pies as opposed to one big one. I tried using the same recipe I always use for a standard 9″ pie plate. It yields enough dough to make a top and bottom crust. I rolled the pastry quite thin and found that I had just enough dough. I couldn’t cut all the circles out of the first roll of the pastry, so I had to collect the scraps and re-roll it a couple of times. If you want a slightly thicker pastry, or don’t want to re-roll your scraps, you could just make fewer pies instead of a full dozen. Fill each cup up to the top with the sour cherry pie filling. In my instructions below, I mention the edges of the bottom crust should stick up a bit out of the tin. I didn’t do this for this batch. Instead I made the edge of the bottom crust flush with the top of the pan and just sort of set the top crust on. The result was the top and bottom crust didn’t stick together very well, and the filling bubbled out between the two layers. So do as I say, and not as I do! Leave your bottom crust a bit longer, and use that extra bit to your advantage to get your top and bottom crust sticking together. 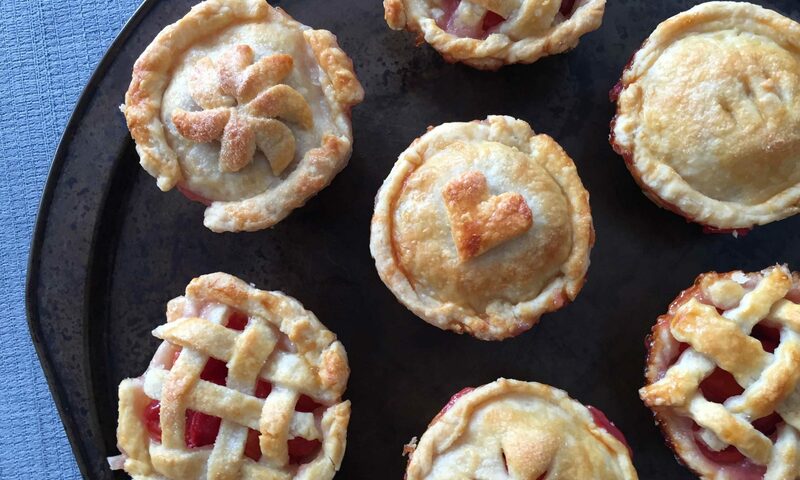 Personalize each pie with a different design on the top crust. I also should have set the muffin pan on a cookie sheet, as the filling did boil over a bit and left a little pile of burnt sugary filling on the bottom of my oven. Chop the butter into cubes and add to the flour. Use a pastry blender to cut the butter into the flour until it is roughly the size of small peas (Don’t break the butter down too much otherwise your crust won’t be as flakey). Add the cold water 1-2 tbsp at a time until the mixture just holds together when pinched (you likely won’t need all the water). Press the dough until it comes together then divide in half. Roughly shape each half into a disc, wrap individually, and then refrigerate for about an hour. In a bowl combine the cherries, sugar, corn starch, lemon juice, almond extract and salt. Mix it all together and set aside. Lightly grease a regular 12 cup muffin pan (My pans are very non-stick so I didn’t grease mine and they still came out just fine. Use your judgement!). Take half your dough and roll it into a thin flat sheet. Use a round cookie cutter to cut the dough into circles about 4 inches round. Place one circle into each muffin cup of the cupcake tin and press down, smoothing it against the bottom and sides of the cupcake tin. You want the top of the crust to stick up a little bit above the top of the tin. Spoon some filling into each of the pie bottoms. 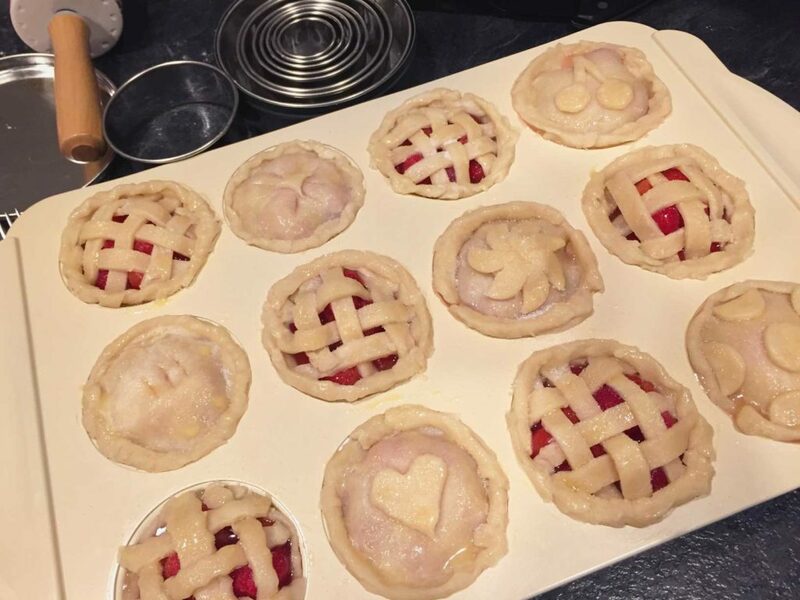 You should have enough to fill all 12 mini pies to the top. Roll out the other half of the dough to make your top crusts. Here’s where you can get creative! You can cut the dough into strips and weave little lattice tops, cut out shapes or just do plain rounds. Whatever your heart desires! Once you’ve got your top crusts on, gently press the edges of the top crust onto the edges of the bottom crust so they stick together. Bake for 25-35 minutes until the filling is bubbly and the crust is golden brown. Remove the pies from oven and let them sit until cool. To remove the pies from the pan, carefully loosen the edges with a knife and gently lift out of the pan. 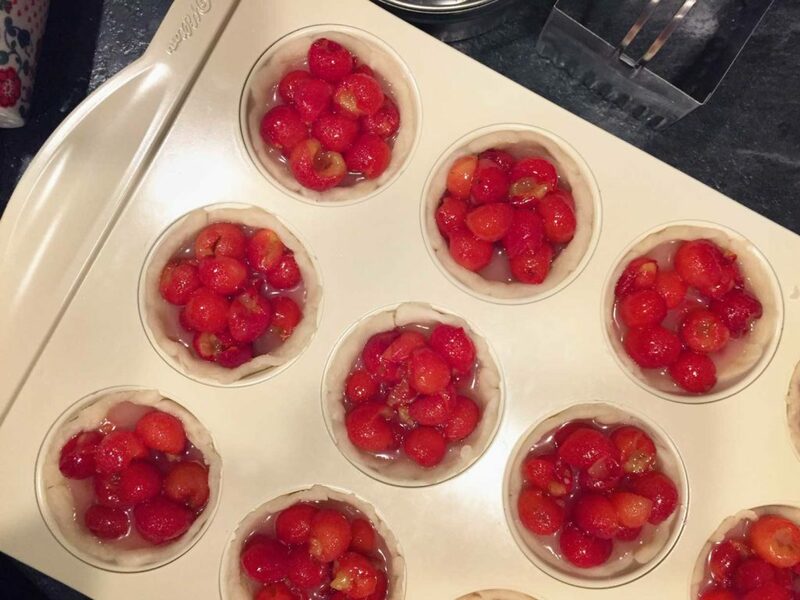 Now I want mini sour cherry pies!!!! You better bring these into the office….